Bicycle Racing on a Budget: Happy New Years Day! Ripley Cross Race. Happy New Years Day! Ripley Cross Race. So we didn't see the New Year in, instead had an early night as we were up at 7am to travel down to Yorkshire for the inaugural Ripley Cyclo Cross, near Harrogate. The closer we drove the wetter it became, eventually parking up in a constant drizzle. It was going to be a wet and muddy affair, first of the season for me! The venue is a delightful spot, an old Yorkshire village with stone cottages, pub, church and castle. The car parks were filling up and despite the weather there was a buzz of anticipation as competitors and spectators filed down to the castle. However after signing on I watched the youth racing a while and an elderly lady pulled up in her car. 'Can you drive in there to the shop, I need to collect the groceries?' I looked at the barriers and the kids racing round, fat chance! I suggested parking up and after the race had ended in a few minutes for her to ask a Marshall to help out carry her groceries, after all it was only a matter of 50 metres. Her reply was, 'it's a damn scandal! I live in the village!' I beat a hasty retreat, 'Lady Downton' wasn't going to string me by the short and curlys'! We have a long way to go for cycling to be accepted by the country class! So the race. We had driven the van round to the drop off point at the far end of the course near the pits and decided it would be best to stay there. Good decision as it allowed a great view of the course. Eva was in the pits, I have a wonderful wet looking wife. Incidentally the correct spelling of her name is Ewa, but in Polish the 'w' is pronounced with a 'vu', with a childish E. Sorted? There were around 80 riders in our section, another 40 or so vet 50 and women setting off behind, a busy course today! The course was great with loads of obstacles, cambers, grass work and changes in terrain, cobbles through the castle grounds and even a Flemish style 'scaffold bridge'. It was wet and muddy and going to make for a challenging race. I managed a few laps, warm up is not the word I would use, and then decided to tumble on the only serious drop off! The landings would be soft today! One of the great aspects of returning to a sport after 20 years is bumping into old racing buddies from times past. One today was Brent Carr, who was out walking the course. It had been over 20 years since I last saw him and it was as if we only parted last week and he hardly changed a bit! So the race again. I was seeded on the second row of the grid, which was good and the start was relatively clean, only loosing a few places. Spray and mud were being thrown up from the tyres and I immediately regretted not having glasses on as I was blinded in one eye with mud. Passing through the castle I managed to wipe away most of it and then set off taking a few places. The top guns were already away as I glanced down the course but I managed to take a few places and then hauled myself up behind Matt Denby (Team Jewson), a quality rider. So the plan was set, hang in as close to Denby and a Harrogate Nova rider as long and as best as I can. That lasted about a lap, but it was enough to secure 10th place. I was riding well, no issues with my sore back and thigh from the crash last Sunday. I was in race mode! I was strong on the long grass muddy sections, hugging the posts and tape to find a clean line! I could close slightly on the two in front but lost loads on the faster cobbles and path sections. I was pleased, but was leaking time. Then Denby crashed or something and he was pushing his bike, I rode up to him as he jumped back on and we slogged through the mud. We both bike changed and I was holding him for pace. It was hard but I was fighting well, then a mistake on a corner, foot down and 3 seconds lost, I never did see his wheel again. That's the problem when you are on your limit and carrying a lardy arse, you can't pick up the pace. Two laps to go and I chased in vain, just concentrating on not making mistakes and being clean on the hurdles and ditch sections. Denby slowly pulled away on that last lap and the wind got up and cut a chill through my sodden skinsuit, it was getting tough out there. But with half a lap to go and somebody shouted that Kenny Johnson, a hitter in my book, was just in front. I looked at the long last grass mud section and could see him at about 20 seconds. If I could only....? This section was muddy and downhill slightly and I managed to find the 'Sven-line' (homage to the Belgian world champion cross rider, Sven Nys), and I clunked it up a gear and flew. I was visibly catching Kenny, but that ramp up over the ditch and castle grounds bit hard at my failing strength. Into the castle, onto the cobbles and easy does it, finished! Tenth place I was to find out later, gasping, and dribbling snots and saliva! Flash of a camera, a bewildered stare, a smile! All over and I loved it! I looked into the mud-strewn eyes of fellow CXNE'r Jon Allen, we smiled,and shook hands, we both knew that was one for the cafe stops and cups of tea! The race was won by Mike Simpson (GS Henley), one of the country's top vet racers, with a great ride by Dicky Noble (TWFS CC) in third place, a CXNE (Cyclo Cross North East League) rider and a fireman who was due to a night duty that evening. Some recovery session that! CXNE riders took some podiums in other categories with Andy Cosgrove (Teesdale CRT) winning the over 50's race, Nicola Davies, ladies vets and young Thomas Mein (MTS Cycles) taking third in the youth race. I should mention the support and camaraderie there is within the CXNE league, a great bunch of people who each week take so much time out to organise, help, support and compete in the races. Today there were a few out encouraging along the course, helping in the pits in the most awful weather. Thanks goes to Thomas's dad John Mein, who help Eva with my pit changes. 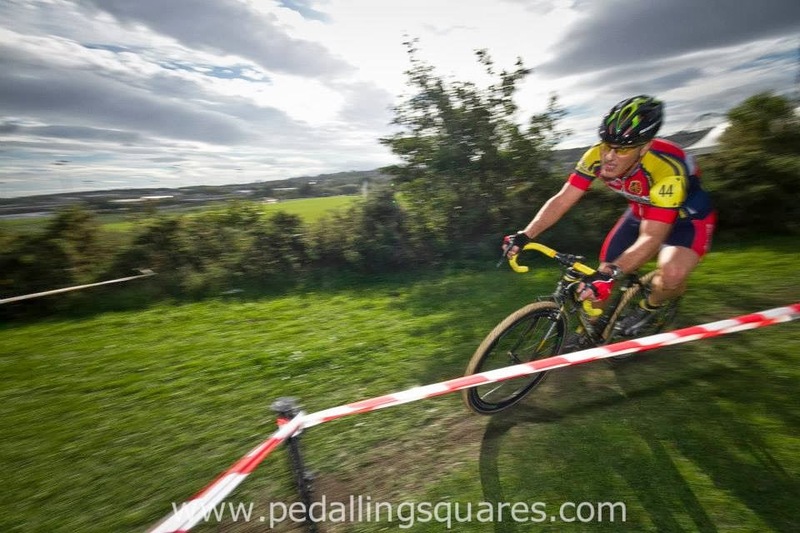 Paul Oldham (Hope Factory Racing Team) making it look easy, winning the senior event. Finally, poor Eva! She was literally soaked through to the skin, right down to her underwear! When she was getting changed in the van afterwards, standing on the seat in just bra and knickers, my daughter Zofia said 'Mum! that man is looking at you in that van!' She was so cold she was past caring! Ripley Castle Cross race is a classic in the making! Ripley Cross, a damn scandal!